My Very First Bible published to high acclaim in 2003 and its popular stories and bright illustrations have since gone onto provide the basis for a number of additional series including board books, big books, sticker and activity books. 12 key Bible stories have now been made available as part of the My Very First Bible series, and are great value, little paperbacks, offering a smart way of collecting multiple books for use in groups and classes, for award-giving, or for anyone wanting a pocket-money gift. 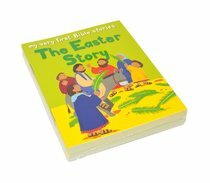 This shrink-wrapped pack of 10 copies of The Easter Story enables easy multiple-purchase of a key seasonal story. About "The Easter Story (Pack 10) (My Very First Bible Stories Series)"